Music & Medicine with Ernest Olmos 4/13/16 Join us for an evening of acupuncture and sound healing. 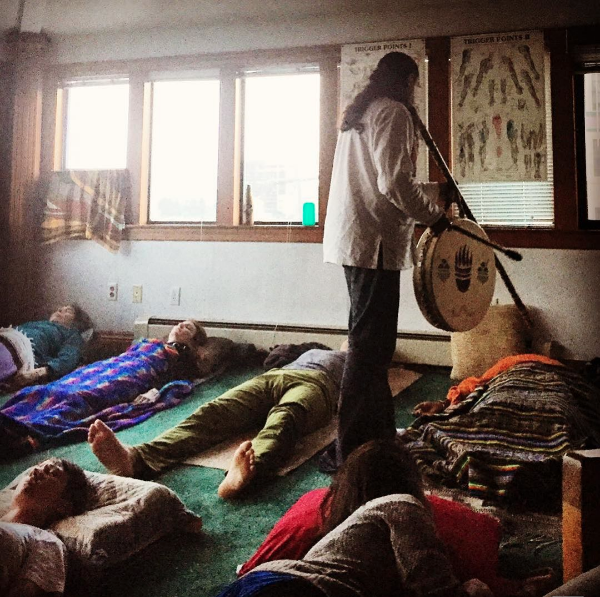 After you receive acupuncture tailored for your energetic pattern, Ernesto will guide you on a journey using copal, sage, flutes, singing bowls, drums and didgeridoo. He will then work with each person energetically using different instruments, some hand made by him. The different frequencies of sound synergized by the acupuncture needles will help you dive into a deep journey of healing within. Music and Medicine on Friday 12/19/15 7-9pm, featuring harp, harmonium and vocals by Maria Jose Montijo, reiki by Misia Denea, acupuncture by Amy Mosley and Rona Luo and cranial-sacral touch by Maria Jose as well. We will make and apply herbal topicals that capture the fiery yang energy of summer to treat asthma, poor immunity and other conditions that are exacerbated in the winter. We will discuss each herb as well as acupuncture points the herbs will be applied on. This hands-on workshop takes place on the first San Fu day of the year, when yang energy is at its peak, based on Chinese medicine’s practice of treating winter diseases in the summer. A complete treatment involves applying this topical on all three San Fu days - 7/13/15, 7/23/2015 and 8/2/2015. Amazingly, studies have shown better results when these herbs are applied on San Fu days as opposed to other summer dates. Rona Luo, L.Ac. practices at Shift Acupuncture Collective and Chinese Hospital SF. She learned this San Fu herbal tradition from her family. Moxa mugwort heat therapy is a widely used self-care tool for supporting menstrual health. In this hands-on workshop, we will learn how to burn various types of mugwort over acupressure points to ease menstrual cramps, regulate menstrual cycle, prevent chronic yeast infections, support fertility and more. Open to who all menstruate or wish to support menstruating people. By understanding the mechanisms of fascia and how they relate to the Acupuncture Channels, we will be able to understand our bodies in a deeper way. In addition to the physical body, we will discuss the relationship of the mind and emotions with somatic dysfunction. We will assess each other and demonstrate ways we can improve our imbalances by using tools such as a foam roller, tennis/lacrosse balls, and other home implements. We will also explore the role of breath in releasing our channels. A hand-on workshop led by Jonlí Montes, L.Ac. LMT integrating his many years of experience as bodyworker with the wisdom of the Chinese Medicine Classics. In this hands-on workshop, we will go over the flow of yin and yang throughout the menstrual cycle, diet and lifestyle tips for different phases of the cycle, as well as simple self-care herbs and acupressure points to support your cycle. Open to all who menstruate or wish to support menstruating people. Wintertime can feel hectic and overwhelming, not to mention cold. According to Chinese Medicine it's the best time of year to slow down. Amy will share tips and information for staying well, avoiding burnout, and enjoying the Winter season.